Call this chicken enchilada recipe perfect, ultimate, or scrumptious. 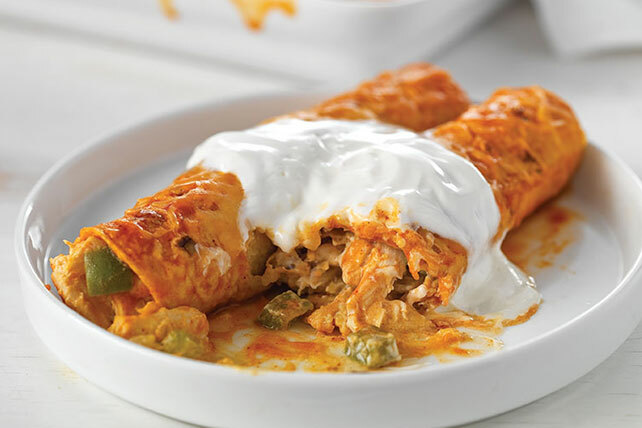 No matter what you call it, our Supreme Chicken Enchilada Recipe is just that good! Mix cream cheese spread, 2 Tbsp. milk and garlic powder until blended. Heat oil in large skillet on medium heat. Add peppers, onions and garlic; cook and stir 5 to 6 min. or until crisp-tender. Stir in chicken, 3/4 cup each cream cheese mixture and shredded cheese, and 1/4 cup enchilada sauce. Dip 1 tortilla in remaining enchilada sauce; gently shake off excess sauce. Spoon 1/4 cup chicken mixture down center of tortilla; roll up. Place, seam side down, in 13x9-inch baking dish sprayed with cooking spray. Repeat with remaining tortillas and filling; cover with remaining sauce. Bake 20 min. Top with remaining shredded cheese; bake 5 min. Mix remaining cream cheese mixture and remaining milk; spoon over enchiladas. Serve topped with chopped fresh cilantro or shredded lettuce, and chopped tomatoes. Enchiladas can be assembled ahead of time. Refrigerate up to 24 hours. When ready to serve, bake enchiladas, uncovered, as directed, increasing the baking time if needed until enchiladas are heated through.